I am sent by King James 1 on behalf of the king’s Elizabethan English. I am come to defend our language from misguided American Christians. Today’s post is in sport. This church marquee puzzleth me. 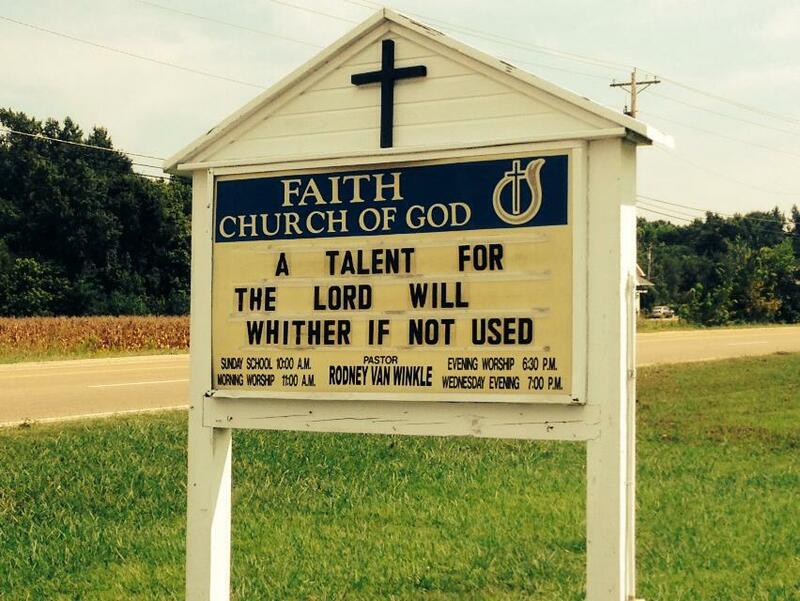 Whither goeth this unused talent? Whence and wherefore is it come? Traveleth it hither and thither like the tongue of an American? Afore have I believed that a talent unattended would wither or be stolen. Henceforth shall I know that it withereth not, but departeth, though whither is not yet revealed. Note: This is a simple misspelling, but I’m guessing that a church marquee is much more likely to have a misspelling like this because of how many Christians either read or are familiar with the King James Version of the Bible. I am not fluent in early modern English, but here are a couple things that might help if you ever want to feign the language of King James’ crew of Bible translators or the works of the great bard, Shakespeare. “Thou” is singular and verbs used with “thou” end in -est. The third person singular is the only other pronoun that takes an unusual ending. He, she, and it add -eth to the verb. Neither I nor any of the plural pronouns get unusual endings. We, ye, and they all allow verbs to remain infinitive, just as in modern English. We run, ye have, and they clap are all correct. Like today’s English, early modern English has many irregular verbs. “To be” is conjugated with I am, thou art, he/she/it is, we are, ye are, they are. Oddly enough, “may” is an irregular verb in Elizabethan English. It is conjugated as thou mayest, but he may, rather than mayeth. I’m not sure why. The same is true with “thou” and “thee.” “Thou” is a subject, “thee” is used when the person you are addressing is the direct object. Thou hittest me, but I hit thee. That shouldn’t be that hard. We already do that with I/me, we/us, he/him, she/her, and they/them. People say that choosing between who and whom is hard, but it is actually no more difficult, and follows the same rules, as I and me or he and him. This entry was posted in Miscellaneous and tagged elizabethan english, grammar nazi. Bookmark the permalink. I’m half Lautzenhiser. Thinking out of the box comes natural to me :-D.
I often wonder how many people read some of those church signs (and other signs of this world also) and never question what the chosen words really say. But, those of us, who choose to take notice, can get a chuckle now and then….and breathe the words, “there, but for the grace of God, go I.” ….into the hither, thither, and yon. Make us smile, young man….I love the way you think! Thanks for the time you take to share your knowledge! Only a KJV only fanatic would be able to understand this post. Thouest the truth! Now, THAT is solid teaching! !